British Air Ministry, AUSTRO-HUNGARIAN FORCES IN THE FIELD, OCTOBER 1918. NEW copy, hardcover issued without dustjacket. Battery Press, 1994; reprint of the original 1918 edition. 225 pages. ~~~ An exact reprint of the Order of Battle of the Austro-Hungarian Army as of October 1918 as prepared by British Army Intelligence. It gives a complete breakdown of the High Command, Armies & Corps along with a complete Divisional List, showing all component brigades, regiments, batteries & smaller units. 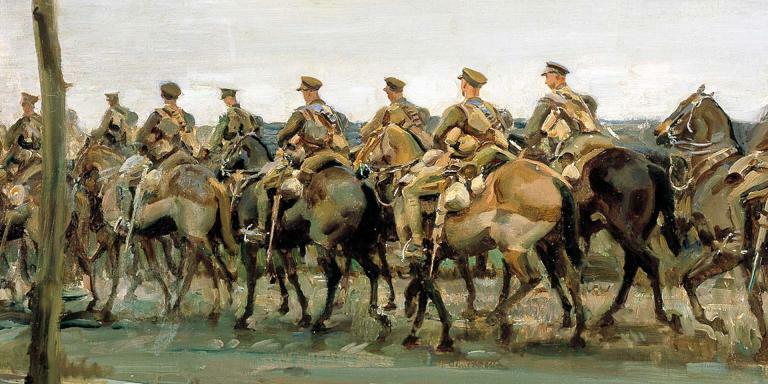 It then presents a complete list of all regiments & batteries, showing much detail on what unit it was a part of, plus information on foprtress commanders, lists of commanders & commands, titular names of regiments and field post numbers. British Air Ministry, HANDBOOK OF GERMAN MILITARY AND NAVAL AVIATION, 1914-1918. NEW copy, hardcover issued without dustjacket. Battery Press, 1995; reprint of the original 1918 edition. 140 pages. ~~~ Originally issued by the British Air Ministry in October of 1918, it is a detailed study of both German Army & Naval aviation services in the Great War. It presents all known information on the general organization & training of every type of air unit, types of units, balloon corps, policy, general tactics, detailed tactics by type of plane, types of communication equipment. The Naval Air Service is detailed in the same manner plus a section with technical details of aircraft with 3-view photos and 4-6 silhouettes of the aircraft at various angles, along with a full technical list of German aviation abbreviations. British General Staff, ARMIES OF THE BALKAN STATES, 1914-1918. NEW copy, hardcover issued without dustjacket. Battery Press, 1996; 26 photographs/drawings, 5 military maps, 552 pages. ~~~ This is a superb collection of six very rare British Army Intelligence handbooks, all of which deal with the Armed Forces of the Balkan nations for both the 2nd Balkan War of 1912-1913 and the Great War. The six manuals are = MILITARY NOTES ON THE BALKAN STATES 1915, HANDBOOK OF THE BULGARIAN ARMY 1909, HANDBOOK OF THE GREEK ARMY 1906, HANDBOOK OF THE MONTENEGRIN ARMY 1909, HANDBOOK OF THE RUMANIAN ARMY 1910 and the HANDBOOK OF THE SERBIAN ARMY 1909. 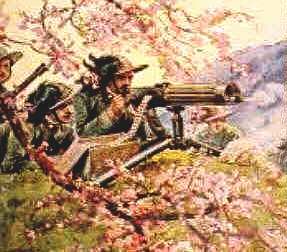 They all feature a detailed study of the organization, weapons, units and locations of each nation's armed forces. 1996 LTD r/p edition, 6 x 9, 411 pp of text, 14 uniform & insignia plates, plus 5 maps on 2 large foldout sheets in end pockets showing military locations in each country." British General Staff, GERMAN FORCES IN THE FIELD, 11 NOVEMBER 1918. NEW copy. Battery Press, 1995. Hardcover issued without dust jacket. Photographs, map, 272 pages. "Originally prepared & issued by the British War Office in a very limited edition of 300 copies marked Confidential in 1920. It presents a very detailed ORDER OF BATTLE of all German combat units on the Western Front as of the Armistice on Nov.11th, 1918. This reference work describes active & reserve divisions, Landwehr, Mobile Ersatz & Landsturm units in each Army Corps. It shows the order of battle for each unit named to include divisions, Naval Corps, Alpine Corps, Provisional Formations, Cycylist Brigades & Jaeger divisions. Researchers will appreciate having Field Post numbers for all units, plus tables of Headquarters & Depots for combat units. There are reproductions of 2 captured maps in a rear pocket which show the distribution of the German Army as of Oct. 30th and Nov. 9th, l9l8." British General Staff, GERMAN MILITARY TERMS, 1918. NEW copy. Battery Press, 1995. Hardcover issued without dust jacket. Photographs, map, 212 pages. 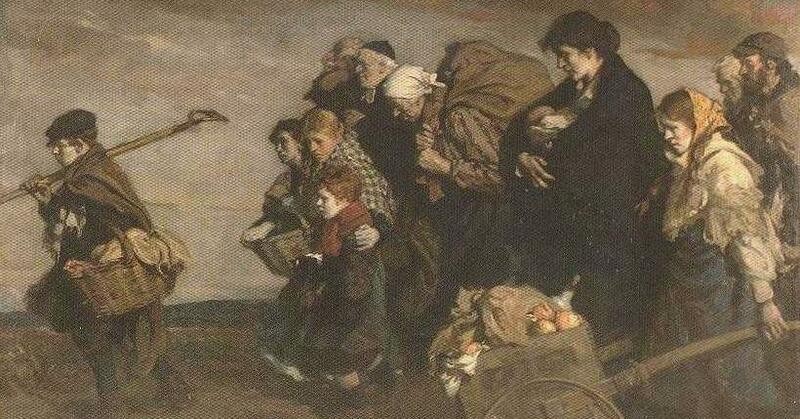 "Originally published by the Intelligence Branch of the British General Staff during the Great War. 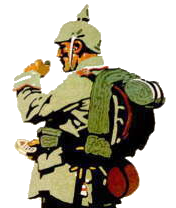 It is a most important work as it is not only a normal dictionary, but rather a compendium of German Military Terms and abbreviations as used by the German Army in the Great War. 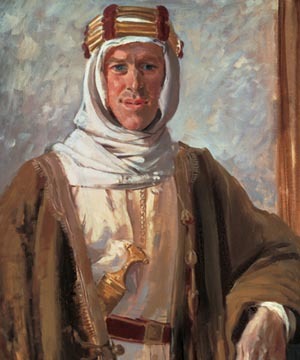 It was published to enable British officers to interpret captured documents, maps & equipment. It contains numerous references to words that were only used during WW One and is therefore a most valuable reference work for any WW I German collector, student or historian. " 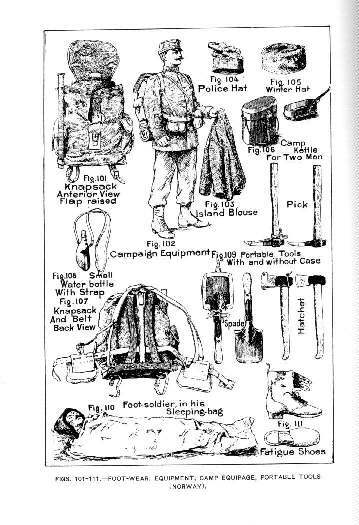 British General Staff, HANDBOOK OF THE BELGIAN ARMY, 1914. NEW copy, Battery Press edition of original 1914 edition. 200 pages. 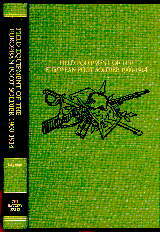 ~~~ Originally prepared by the British General Staff's Intelligence Branch, this is a comprehensive reference book on the Belgian Army at the beginning of World War I.
British General Staff, HANDBOOK OF THE GERMAN ARMY, 1914. NEW copy. Battery Press. Hardcover issued without dust jacket. 345 pages. "This is the British General Staff's intelligence manual for the German Army at the beginning of World War 1. 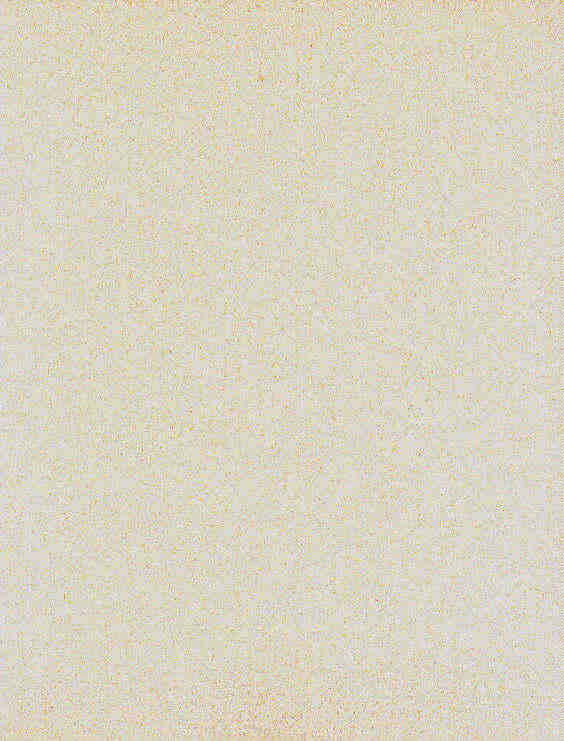 Originally printed in 1912 and amended to August 1914, this reference volume has chapters on the conditions of service, organization and numbers available in peace and war, administration of the Army and General Staff, infantry, cavalry, artillery, technical troops, supply and medicial services, tactics, signalling and colonial troops. Also included are appendices giving military pay, military terms, topographical signs and abbreviations and much more"
British General Staff, HANDBOOK OF THE GERMAN ARMY AT WAR, APRIL 1918. NEW copy. Battery Press, 1996. Hardcover issued without dust jacket. 17 photographs/drawings, 217 pages. 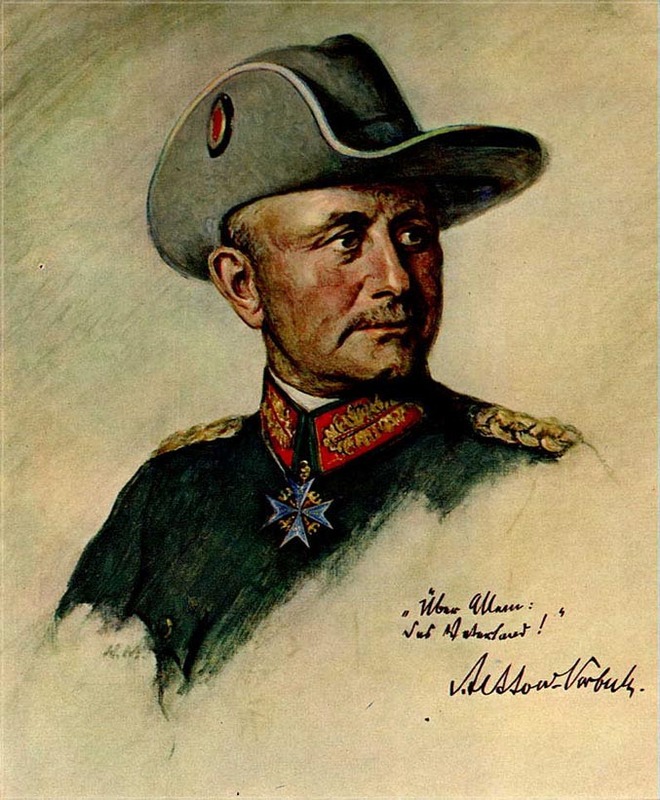 "Originally prepared by the British General Staff's Intelligence Branch, this is the last reference book on the German Army produced by the British before the end of World War I." British General Staff, HANDBOOK OF THE ITALIAN ARMY, 1913. NEW copy. (Battery Press: 1995). Hardcover issued without dust jacket. 1 map. 222 pages. 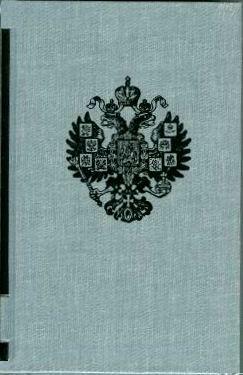 ~~~ Originally prepared by British Army Intelligence, this is a reprint of an ultra-rare manual which describes in great detail the Imperial Russian Army on the eve of the Great War. It covers the organisation of all branches of the army, a complete order of battle with peacetime stations, Coirps affiliations and more. Lists of titles of Russian regts, lists of fortresses, uniform notes, titles, particulars of field & seige artillery, military equipment, Morse codes, Russian alphabet, glossary of terms & map signs. British General Staff, HANDBOOK OF THE RUSSIAN ARMY, 1914. NEW copy, Battery Press, 1996 edition of original 1914 edition. 15 photographs/drawings, 336 pages. 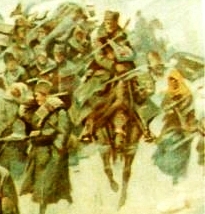 "Originally prepared by Brirtish Army Intelligence, this is a reprint of an ultra-rare manual which describes in great detail the Imperial Russian Army on the eve of the Great War. It covers the organisation of all branches of the army, a complete order of battle with peacetime stations, Coirps affiliations and more. Lists of titles of Russian regts, lists of fortresses, uniform notes, titles, particulars of field & seige artillery, military equipment, Morse codes, Russian alphabet, glossary of terms & map signs." 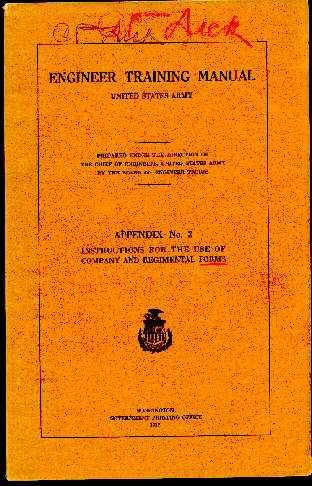 Chief of Engineers, U.S. Army, ENGINEER TRAINING MANUAL, UNITED STATES ARMY: APPENDIX NO. 2, INSTRUCTIONS FOR THE USE OF COMPANY AND REGIMENTAL FORMS. Washington, DC: Government Printing Office, 1917. VG-- Paper covers. Signature of original owner on front cover. A few tiny tears to covers & title page; old flattened crease to upper corner of front cover. Volume otherwise tight & clean. Numerous forms reproduced throughout book, together with detailed instructions. Forms include: morning report, sick report, ration return, requisition for forage, duty roster, pay voucher, mileage voucher, service record, company council book, advice of soldier's deposits, soldier's allotments, discontinuance of soldier's allotment, muster rolls, extra sheets muster rolls, pay rolls, various discharge forms, delinquency record, inventory of effects of deceased soldiers, report of death & disposal of remains, military correspondence, company return, field return, various rifle & pistol firing reports & records, charge sheet, non-com officer's warrant, furlough, various clothing forms, equipment receipt, descriptive card of public animals, certificate of disability for discharge, inventory & inspection report, guard report, morning report, regimental return, return of casualties, plus various other minor forms. 226 pages. 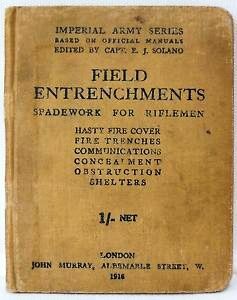 French General Staff, FRENCH TRENCH WARFARE, 1917-1918: A Reference Manual. Battery Press reprint of the original 1917 French Army edition. Over 280 photos & drawings, 387 pages. 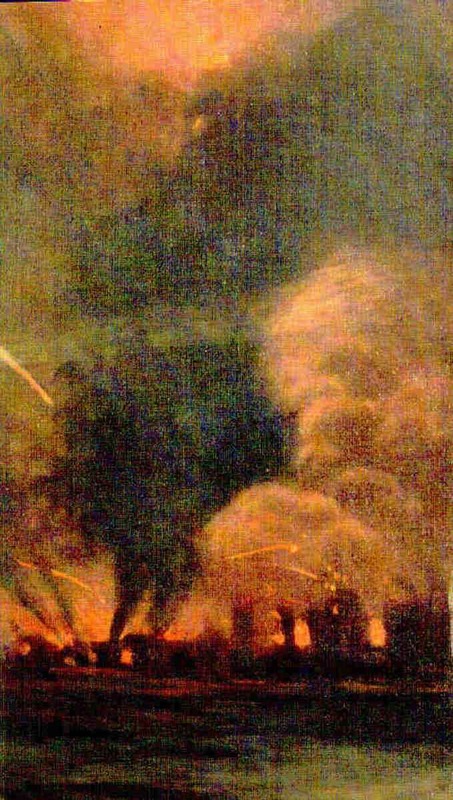 "Originally published as a training manual for junior officers, this reference volume is a comprehensive review of French combat methods in the latter stages of World War 1. 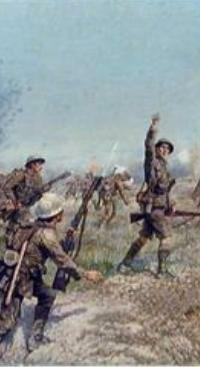 There are chapters on the principles of command, infantry training, weapons and support materiel, and trench tactics. It is oriented towards platoon and company operations. 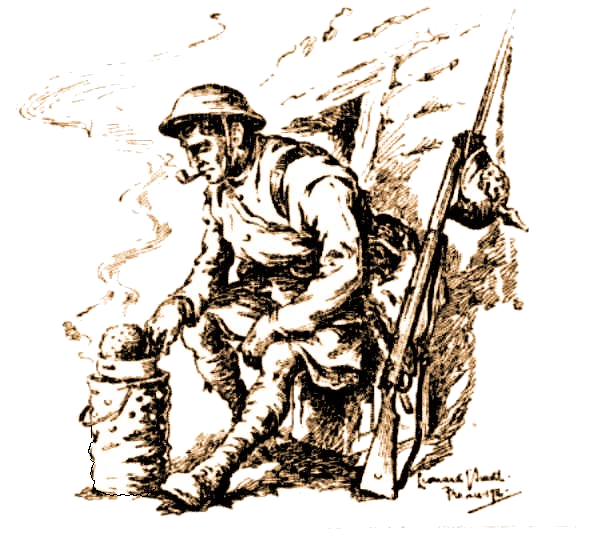 The many illustrations make it particularly valuable as a guide to how French troops fought on the Western Front during the Great War." 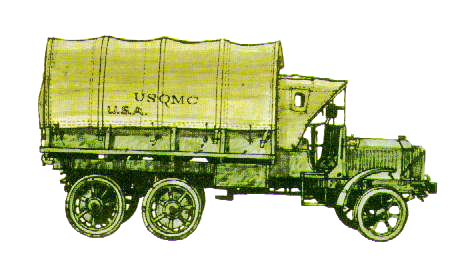 Signal Corps, United States Army. 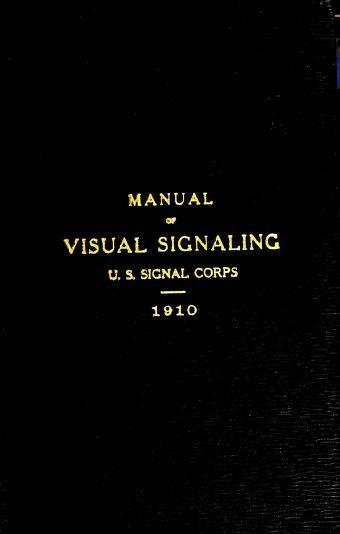 VISUAL SIGNALING OF U.S. SIGNAL CORPS. War Department, Office of the Chief Signal Officer, 1910. VG. Gilt lettering on dark brown boards, 4.5"x 7.5". Lettering bright on both cover & spine. Virtually no wear; corners turned in just at tips. An exceptionally bright, tight copy. Signature on front endpaper reads: "Signal Corps, Va. Vol. Richmond Va." [a Virginia Volunteers' copy]. Profusely illustrated with charts, diagrams, drawings & photographs. 133 pp. ~~~ Contents reads as follows: INTRODUCTION; VISUAL SIGNALING DEPARTMENT: flag kit, heliograph, signal lantern, rockets & shells, semaphore, searchlight, Coston signals, Very's night signals, Ardois system of signaling, sound signals, improvised signal methods; ALPHABETS OR SYSTEMS OF SIGNALS: signal alphabets, code calls, execution of signal alphabets (Army & Navy alphabets, Morse alphabets), international code of signals, Ardois system, Coston signals, Very's night signals, Rocket signaling, Two-arm semaphore alphabet (US Navy), summary of signals; THE FIELD MESSAGE: definition, the blank form, writing the message, instructions to operators, locations of stations, finding a station, operation of stations; CODES & CIPHERS: codes in use, employment of codes, cipher code, the War Department code, cipher code in field work, field ciphers, cipher apparatus, the cipher disk, the mathematical cipher, the route cipher, cipher detection; FIELD GLASSES & TELESCOPES: reflection, refraction, lenses, focus, optical center, image, conjugate foci, law of foci, formation of image, spherical aberration, chromatic aberration, telescopes, Galilean field glasses & telescopes, Porro prism field glasses & telescopes, field glasses, properties of telescopes & field glasses, field glasses & telescopes issued by the Signal corps, field-glass specifications. 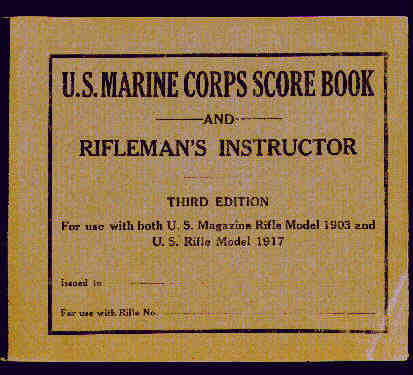 Harllee, Lieutenant Colonel William C., U.S. Marine Corps U.S. MARINE CORPS SCORE BOOK AND RIFLEMAN'S INSTRUCTOR, THIRD EDITION, FOR USE WITH BOTH U.S. MAGAZINE RIFLE MODEL 1903 AND U.S. RIFLE MODEL 1917. 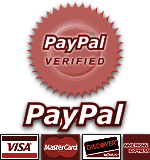 ~~~ The shooting manual used by the Marine Corps during World War I and between the wars.